We’re back, with another installment of engagement gift ideas for men and women! Back in Part I I mentioned giving a gift of thank you cards to the newly engaged couple. Well, low and behold, a few months later I discovered the perfect set of cards! Sent-Well makes absolutely gorgeous and extremely high quality cards. We are talking probably the highest quality cards I have laid my hands on and I have held some rather pricey cards in my day. (That is a completely normal thing to say, right?) Best of all? 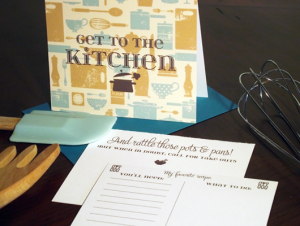 They make prepackaged sets of wedding party thank you cards! You can swoop in as the very thoughtful friend and give these as an engagement gift. You are both providing a gift, and helping the couple tick off one more thing from their to-do list as they get closer to the wedding. Suggested sentiments packs are $24.00. Don’t worry if your friends are going to have 14 wedding party members, either. You can have the number of cards adjusted as you see fit, or add in or swap for some other titles, including Jr. Bridesmaid, Jr. Groomsman, Officiant and Matron of Honour. For an extra bonus, there’s some suggested sentiments, to help your friends with writing the messages. There is a whole selection of cards available. I was lucky enough to get a peek at some of the Keepsake Cards, which include a tear off blank recipe card, to be added to your collection. As an extra bonus, Sentwell has generously offered us all a coupon code, worth 15% off until September 30, 2013. Use UNIQUE13 at checkout. When was the last time you sent a card in the mail? 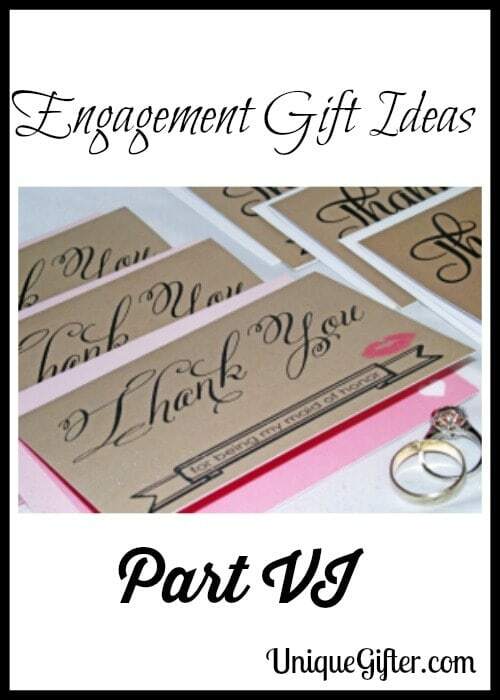 Are you looking for more engagement gift ideas? Perhaps specifically engagement gifts for men? Looks like a really sweet option, Anne. And it's definitely affordable! Yes, they're cute and at $2 a card quite a good deal. They are seriously so thick and have such nice ink, it's amazing! I like to send a thank you card in the mail every once in a while. People really seem to appreciate them. Definitely. A real, in-the-mail card is so appreciated these days! People really do find a handwritten note to be more personal – makes them feel special. That's what we are all about! They look like pretty cool cards. I send cards in the mail all the time but back home. i think the bride and groom will appreciate the ease in using these cards though since they are personalized the way they are. There are so many great ideas out there. We didn't have a traditional wedding so none of this was needed but for those that do, it's great. Cards are always awesome – you should pop some in the post! Non traditional wedding? Care to post about it for us one day?